Finding reliable budget filtration options can be pretty difficult. Canister filters have long been the preferred method of filtration, but they can also be quite expensive. 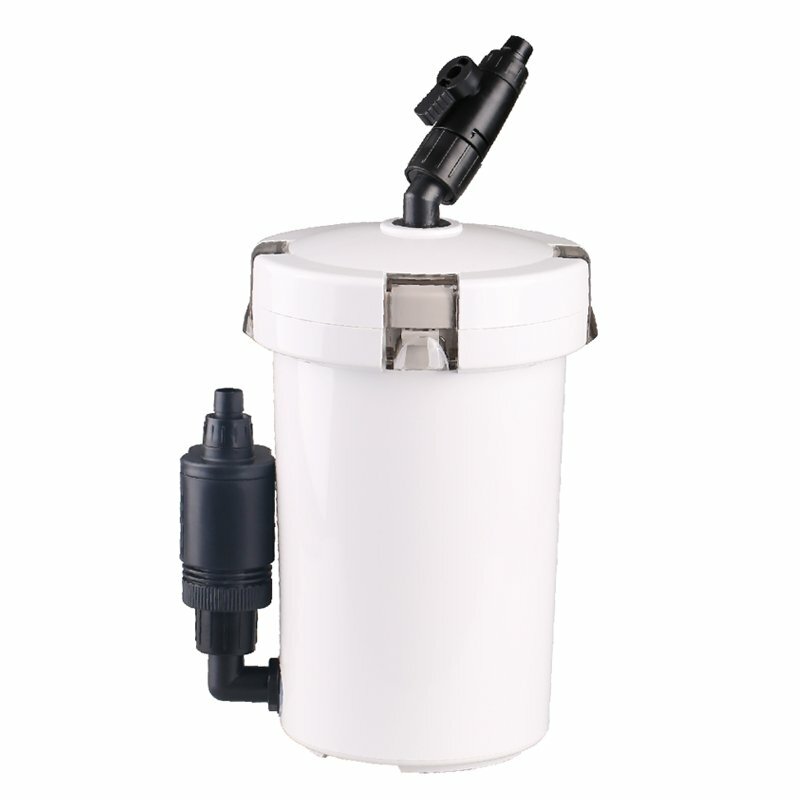 However, the SunSun Canister Filter is a powerful, quiet, and reliable fish tank filter choice for tanks up to 200 gallons. They can be an affordable option. 1 What Is the SunSun Canister Filter? 2 What Does the SunSun Canister Filter Provide? 3 How Difficult Is Cleaning and Maintenance? 5 Where Can You Buy the SunSun Canister Filters? 6 Is This the Best Canister Filter For You? What Is the SunSun Canister Filter? SunSun Canister Filters are sold by various sellers under different business or brand names such as Polar Aurora or Flexzion. They are easy to spot as they are white and very similar in appearance. SunSun brand is produced by Weierma Electrical. I have commissioned equipment manufactured to specification directly with Weierma because they offer good products at reasonable prices. 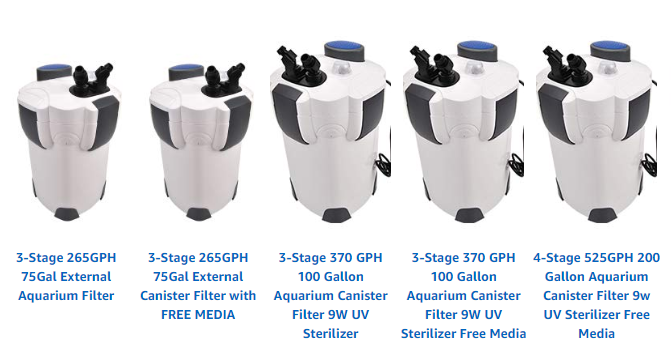 The ‘B’ filters have a 5W/7W/9W UV sterilizer for controlling algae spores/bacteria and promoting clear water. The SunSun filters are often sold online identified by their respective maximum flow rates in Gallons Per Hour (GPH). Equally by how many stages of filtration they offer – 3 stage or 4 stage. It is very unusual to see the actual model number advertised. What Does the SunSun Canister Filter Provide? The SunSun Canister Filter comes with three or four separate media trays that will enable you to use the type of media that you prefer for your tank. These trays are on the large size which means that you will not have to clean the trays as often as you might with a smaller filter. As is the case with most canister filters, these trays are designed to hold three or four separate types of filtration media – biological, chemical, and mechanical. The type of media that you use will depend on many factors, not least of which is whether your tank is freshwater or saltwater. The filters can be bought with media as part of the package. This includes a selection of filtration pads, ceramic rings and “bio balls”, and coarse pads to get you started right away. Another feature that is included with these filters is an adjustable spray bar. You can also use a spray nozzle, though a spray bar is a great way to distribute freshwater throughout your tank without creating unnecessary turbulence. There are some fish and plants that require this kind of distribution of water in order to thrive. Unlike some similarly priced high-powered filters, some SunSun Canister Filter models come with an included 9-watt UV sterilizer. This is extremely helpful at eliminating harmful bacteria and algae and certainly will help your water to stay cleaner for much longer. How Difficult Is Cleaning and Maintenance? Let’s face it – no one likes to clean an aquarium filter. But, the SunSun Canister Filter makes cleaning quick and easy. 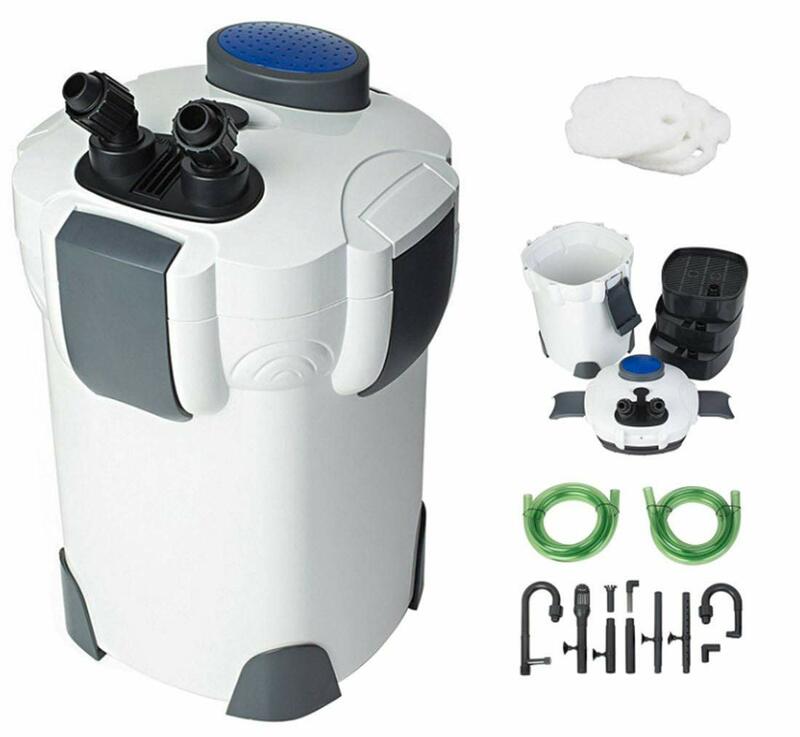 This fish tank filter features a self priming pump which means that you will not have to manually prime your filter after cleaning or after a power interruption. Another feature that makes cleaning easy is a single valve disconnect. By simply turning a valve, you will be able to disconnect the tubes, preventing leaks during cleaning. Once the filter media has been cleaned and you are ready to reconnect the pump, simply attach the tubes, turn the valve, and you will be ready to go. In addition to the obvious benefit of the SunSun Canister Filter being a sturdy and powerful canister filter, many reviews mentioned just how quiet it is. When you consider how much water is continually flowing through this filter, it is somewhat unusual that it would be as quiet as it is. Having a filter that does not make a lot of noise or cause vibrations is obviously important both to you and whatever is living in your aquarium. This filter is able to handle large volumes of water, and that is something that is obviously very important if you own a large tank. Being able to handle up to a 200 gallon tank, and operating at a maximum flow rate of 525 gallons per hour, you might expect that these filters would be larger than they are. Of course, it is too large to be attached to the side or rear of any tank, but it is not so bulky that it cannot be stored beneath or beside a well-placed tank. The benefits of canister filters are many and our article on the benefits is worth reading if you need more information. Is There A Downside to This Product? There do not seem to be a lot of drawbacks to the SunSun Canister Filter, though you will want to pay particularly close attention to the hoses and pipes that are connected to the device. They may need to be replaced over time, though that is not unusual at all. They are great for fish – some reviews have raised the issue that they do not cope very well with other aquarium inhabitants like turtles due to the filtration levels being higher than these are designed to deliver. 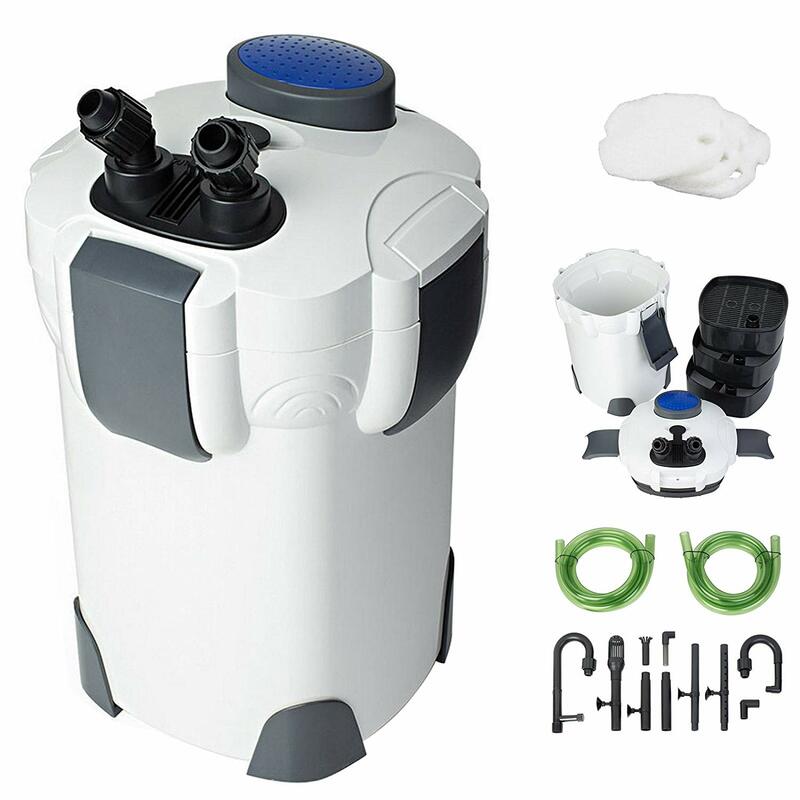 Of course, if you are in the market for a filtration system that has a lot of variables or other features, then this might not be the best choice. The SunSun Canister Filter is very straightforward and easy to use, and is certainly appropriate for people who have never installed or operated a canister filter before. Where Can You Buy the SunSun Canister Filters? Even though SunSun is a well-known name in aquariums, finding this particular model in your local pet store or aquarium store might not be possible. As a result, buying this online is probably going to be the best way to go. You can then choose from the different models of SunSun canister filters as well as order additional media, tubing, or other accessories. Is This the Best Canister Filter For You? Because the SunSun Canister Filter is considered a low priced canister filter, you might be surprised at just how powerful it is. When you also consider that it is built to be one of the quieter models as well, then the decision as to whether or not this is the right filter for you seems pretty clear. As the owner of a large aquarium, I know that having a dependable filtration system is perhaps the most important factor to consider. Based on the numerous reviews online, it would seem as if the SunSun Canister Filter is one that has made a lot of aquarium owners – and their fish – very happy.